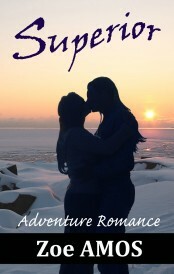 “Superior: Adventure Romance” coming November 7th. It’s coming out time! Not me – I’m already out. It’s “Superior,” an adventure romance novella, scheduled to come out November 7th on Amazon. Despite beliefs to the contrary, writing is not the hardest part of getting out a book. No. Writing is the “I’m in the zone and time has disappeared” feeling. I am frequently asked about my process, so I will indulge. Here to interview me about my writing is…me! Zoe: “Superior” takes place in the not-too-distant future in Superior Protectorate, formerly the Upper Peninsula of Michigan. Climate change has caused social upheaval and the new government has enacted restrictive behavioral norms in exchange for peace. Two young women will soon be of marrying age and obliged to share their future with a selected husband, instead of one another – a forbidden prospect. Conflicted by their upbringing and societal expectations, the lovers find themselves thrust into unexpected situations brought on by their illicit affair. Excitement builds as the two women react to twists in plot and action. They risk everything in their perilous quest for freedom and a life together. Sounds like a mix of adventure, danger, and romance. Yes. The story moves quickly as the two main characters work through their mounting struggles. They’re resourceful, calling on both their physical and intellectual strengths, but it’s their passion for one another that drives their behavior and adds heart to the story, even when all seems lost. I grew up in Michigan and spent my summers traveling in the northern part of the state. I loved describing the natural beauty there, and because climate change figures prominently, the proximity to the Great Lakes makes it the perfect location for this story. The action/adventure part came to me over a decade ago. For years, I never did anything except jot down a few notes. Like most of my writing, I thought it would be a short story, but once I got going and fleshed out the characters and scenes, it grew into a book. A lot goes into it – the writing, the editing and re-editing. I use a professional editor and several readers, one of whom pointed out something important that made me change the ending. It’s been a year since I started. Anyone who appreciates good adventure, personal growth, dystopias, coming out, romance – whether or not they’re lesbian – Michigan residents, and readers who like to get out of their heads and into a different environment with new scientific developments. And, of course, people who have enjoyed my other writing. Do you have anything else in the works? Yes, in addition to the e-book short stories I regularly publish, I have other books in the wings, both novels and short-story compilations. All in good time! Watch Lesbian.com for an upcoming book giveaway! Details soon to be announced. Zoe Amos brings her lesbian point of view to articles and stories on diverse topics. Connect with her on Facebook and Twitter. “Superior” a novella, coming soon! Read her stories on Kindle and Nook. Check out her other life at: www.janetfwilliams.com. Posted October 23rd, 2013 & filed under Blogs.